Cast in solid resin and full of detail, this is a four part set with each piece different. Two pieces are of shorter stacked logs which can be butted together to form a longer individual section. These ubiquitous pieces of scenery can be used from ancient times up until the modern day. Stacks of logs would be seen in most places where humans populate near woodland! 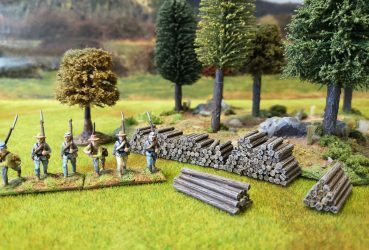 At the side of tracks and roads, in corners of fields, cleared sections of forest, against the wall of houses, next to barns etc…. there uses are endless! 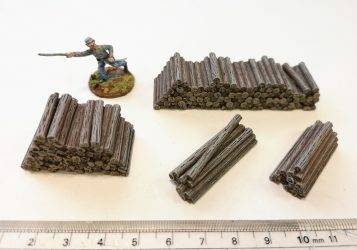 You could also use the 15mm 1/100 scale versions with 20mm figures – they would just represent smaller logs and would be better suited in some cases for household fires. The smaller cut log sections are 7cm and 3.5cm long, the pole sections are 3.8cm and 3.4cm long.